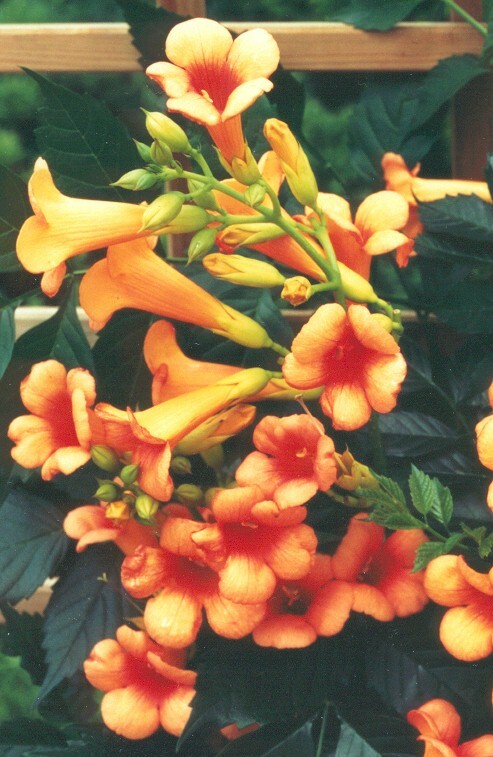 "Indian Summer" ® Pride of Place Plants Inc.
Foliage pinnate, (11-) 13 (-15) pinnula, 25-40 cm long, dark matte green,Underside light green; pinnula 7-10 cm long, 3.5-4.5 cm wide, tapered,Coarsely serrated, lower pinnula have stems. pentalobate, lobes nearly round, crown 5-6 cm in cross-section, orange-red ( RHS color chart 31B, later 35A ); pistil and stamens pale yellow, calyx c.5-3 cm long, five sepals, gently tapered, green yellow to yellow. Won the Gold Medal for the Best New Plant Introduction at the Plantarium 1998 Exhibition held in Boskoop,The Netherlands. Jarditec 1999 Exhibition held in Paris, France. 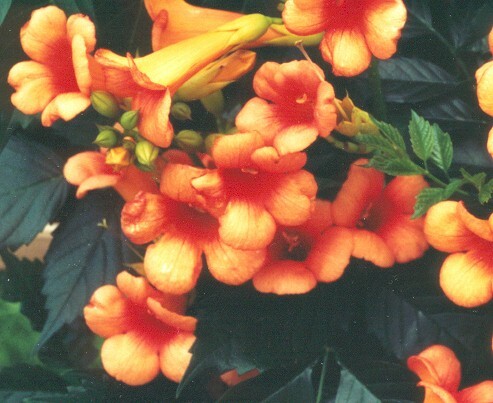 "Indian Summer"™ is the trademarked name for Campsis x tagliabuana 'Kudian' P.PA.F. Propagation is prohibited, except by licensed growers in the U.S.A. and Canada. The U.S. Patent Office has now assigned Campsis x tagliabuana' Kudian ' the Patent Number 13139. The Patented product,or the packaging or labeling for the product,when the product itself cannot be marked,must be marked with the patent number. A marking such as " U.S. Patent No. PP13139 " or " Pat. PP13139 " is deemed as an adequate notice. Thank-You for your continued interest in Campsis x tagliabuana ' Kudian ' " Indian Summer ". 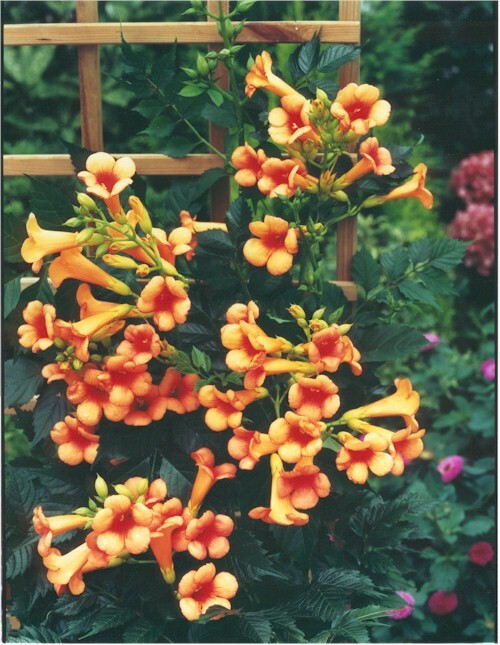 Indications are suggesting this cultivar has become a " Must Have" for Landscapers and Garden Centers.